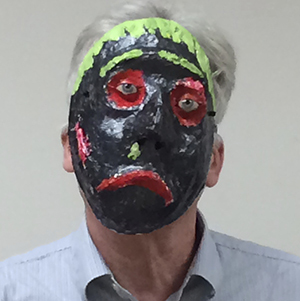 I had the good fortune to be in Second Sense’s Masks and Mayhem workshop. The word Mayhem in the title is what really caught my attention. That’s all it took to get me to sign up for the workshop. 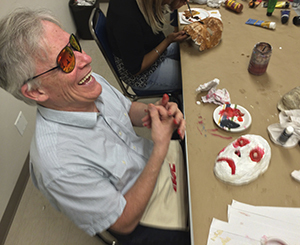 The workshop was led by Jeff Semmerling from Semmerling and Schaefer Mask Artists Studioand helped along by Stella De Genova, artist and Second Sense volunteer, Marcia Knudson, Manager of Counseling, and several volunteers. The participants were an interesting group: Andrea I had known for a while and I knew Patricia from around Second Sense. Steve, Donna and Samantha “Sam” were new to me. Jeff showed us several different kinds of masks and explained what we were going to do in the work shop. I always enjoyed working with my hands so the first part was a lot of fun for me. We all had blocks of clay to form the shapes we wanted for our masks. I had already decided my mask was going to be scary so I tried to put that into the face I was forming. A down turned mouth, a large nose, a scar and my old plastic eyes finished the design. The masks were stored in Marcia’s office until we returned the next week. The next step was to cover the clay with small pieces of brown paper bags. This was done by covering the paper with glue and then putting them on the clay. This was tedious and funny at the same time. The glue would cover our fingers making it almost impossible to let go of the pieces of paper and stick them to the clay. I had to laugh in frustration as the paper just would not let go of my fingers. We had to put several layers of paper before we were done. Now we had to cover the paper with a white substance called Gesso. Jeff came around with brushes but yours truly used his fingers to spread it around. I think everyone else used the brushes. 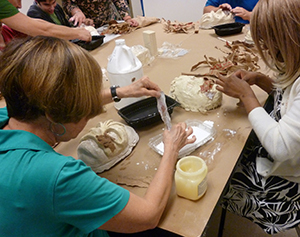 This coating is used to hold the paper together and ready the masks for the next step, painting. Again the masks went into Marcia’s office to dry. Now it was time to decorate our masks. Jeff brought a large number of paint colors for us to use. I was a little surprised by the kinds of colors every one used. For example gold wasn’t good enough — a little brown had to be added. Everyone had specific colors in mind for their masks. Mine was easy, black, red and a snot shade of green. While we waited for the paint to dry we talked about how much we enjoyed the workshop and how we might get together again for something different. Jeff asked each of us to put our masks on and give a performance. I did mine first as I had been planning my mask from the very beginning. I put my scary mask on and said “I am Shytan, bringer of darkness, destroyer of the light, breaker of spirits, stealer of souls,” then I loudly hit the table and said “Fear me.” Patricia did a story for her mask saying she was in New Orleans and could foresee the future. Donna’s mask was a happy one and she spoke that way about her mask. Now it’s your turn. If you made a mask, who would it be? Fred Nickl is a long-time volunteer at Second Sense. He took his first computer class at Second Sense and has participated in many activities here.